Oh boy, this is going to be a hard post. For the first time in I don’t how long, I actually do not like a place. This was my first visit to Tatami, so I did what I normally do when I visit a restaurant for the first time: order everything I think I would like from the menu. That’s how I ended up ordering two salads, Edamami, 2 kinds of Maki, Lobster Teppanyaki, and Banana\Chocolate Spring Roll. My friend who, unlike me, loves Sushi and Sashimi ordered a double platter of Salmon, Tuna, Scallops, and what I think is Sardine. The first salads we tried was the Spinach & Shitaki Mushroom, which was ok in my opinion. I just didn’t like it much, and I don’t think I would order it again, the dressing and the fresh spinach were just too bitter for my taste. Now the other salad, I forgot what it was called but it came in heavily recommended by our waitress, was not tasty at all. The cucumber and carrots were too spongy, and it came with shredded boiled shrimp instead of shredded crab because they were out of crab. I personally didn’t like this salad at all, but my friend seemed to like it just fine. It’s definitely not something I would order again. We had ordered the Edamami with the spicy mayo dip, and it was an ok dish. It’s a dish that I would for sure order again, only for the lack of other more favorite dishes. Now we come to the Makis. They were for me. I ordered the Spider, which I think was made with fried crab. And the other maki was a regular Ebi Tempura one. Only changes were that I asked them to use rice paper instead of seaweed. The Tempura roll was good, but the spider one smelled just a bit too strong for me. My friend agreed that it did smell a bit too strong too, but she loved the Tempura Roll. As for my friend’s dish, the Sushi\Sashimi; she loved it. She’s a regular at Tatamai, so she knew what to order, and even made it a double order too. That’s how much she loved it. Good for her. I had thankfully ordered a Teppanyaki dish, just in case I didn’t like my other orders. My Lobster Teppanyaki comes in a cream sauce, and I asked them to make it with extra sauce. I loved this dish. Oh My God, it was so good. The sauce was creamy, yet spicy. The Lobster was both tender and juicy, and the vegetables were really crispy but still very tasty. This is definitely what’s going to get me back to Tatami. This Lobster Teppanyaki is the best that I’ve ever had in Kuwait, and I’m going to Tatami again and again to eat it. We finished our meal with the Banana Chocolate “spring rolls”, which come with creme englaise. If you know me, you would know that I am not a fan of desert; so you shouldn’t take anything I say about desert negatively. I just don’t like desert. And this Banana Chocolate was not an exception. But in my defence, even my friend said that it normally tastes a lot better than it did today. We ended up our meal with espresso for the both of us. I don’t really know how much our bill was, cause my friend paid for it. But I would assume it was a hefty amount. Sushi, Sashimi, and Lobster aren’t cheap dishes. I really wish I a better review of Tatami. And I seriously hope I won’t get into trouble, like when Mark reviewed Banihanna. But honestly, Tatami is a very good place. You could see that the quality of food was super high, the service was super friendly, and the menu was actually quite extensive to meet many differing tastes. I just didn’t like the salads or the Makis. Then again, my taste in Japanese food leans towards the kind Meli Melo & Maki serve; not what Kei or Tatami serve. I’m just not that adventurous, plus I’m actually a picky eater. 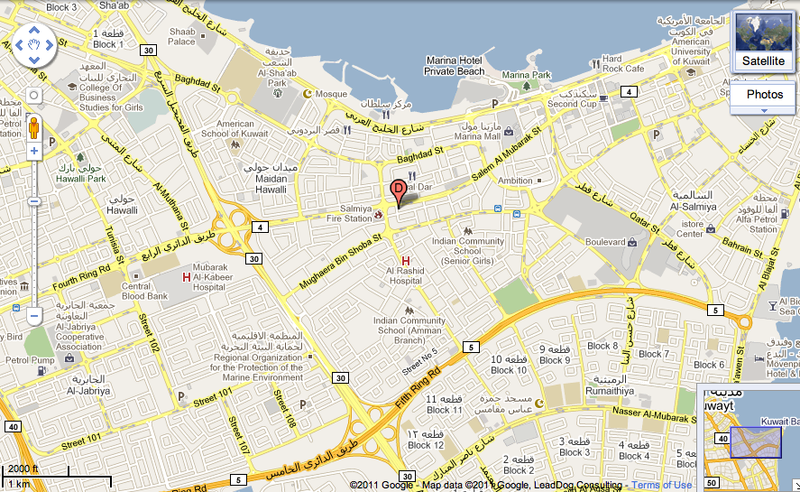 You can find Tatami in Sharq area, Omar Bin Al-Khattab St., in the same building as Gulf Bank, and opposite Al-Ghanim’s showroom. Their phone # is 2225-1265. I included their map to make it easier for you to get there. I don’t know if I have mentioned this before, but Armani Cafe in Dubai is one of the best food places in the Gulf. I’m starving right now and that got me thinking of getting a Roma Burger from Open Flame. But since they don’t do take-out, I let my imagination go to other venues, and I decided on Nino’s Veal Milanese & Rocca salad. Anyways, though Nino’s veal milanese is very good, it didn’t stop me from thinking of the best Veal Milanese I’ve ever had outside of Europe: at Armani Cafe. It’s so delicious and tasty, it’s perfect. I remember once, I asked the chef to come out to play a game of guess the ingredients with me. One of the other foods I love there is their Truffle Bruschetta. It comes full of Truffle paste and Truffle shavings. I love how they don’t skimp on ingredients at Armani, even with such an expensive one like Truffle. This Bruschetta is just to die for, not to be missed at all. Truffle shavings. The smell of the pizza hits you right on the spot. It’s one fancy super delicious pizza. You can find Armani Cafe in Mall of Emirates, First floor, between Versace and Dolce & Gabbana, on the Rodeo Drive path between Harvey Nichols & Debenhams. Check out my other restaurant reviews: Memories of China-Bahrain, Il Tirrazzo-Riyadh, Meat Co., Fat Burger, Cafe Italia-Bahrain,and Four Seasons Brunch-Riyadh. I wanted to have Kabab 7ijja for dinner tonight, but they were sold out of meat. So the guy there suggested I try a Kabab sandwich, which I never even knew sold. I knew they had chicken Shawarma sandwiches, but never of meat Kabab ones. I ordered one of each, and they both tasted good. I would even date say, they both tasted really really good. 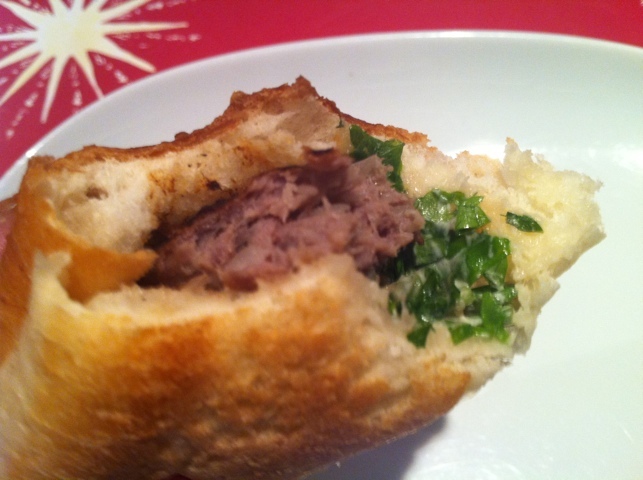 The Kabab sandwich comes stuffed with green leaf vegis and some kind of white sauce, not 6e7eena though. The chicken Shawarma comes with the same green leaf vegis, garlic sauce, and pickles. Next time, I’ll order my Kabab sandwich with grilled tomatoes, since I love them so much. 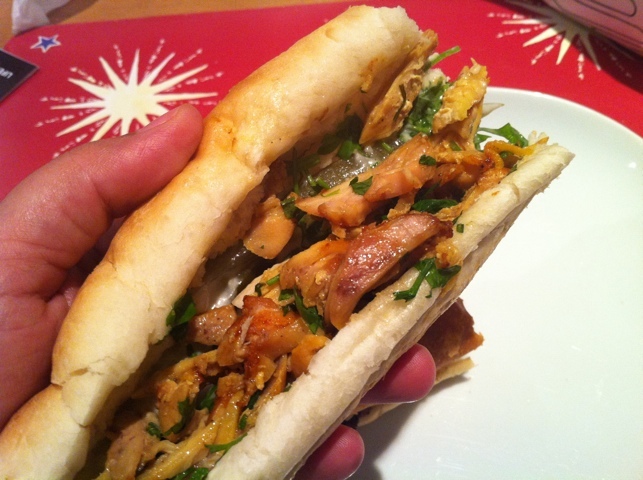 I wouldn’t change anything on the Shawarma, the chicken is cut nicely and the portion isn’t overwhelming. The sandwiches are 250 fils each, which is damn cheap mashalla. Burger King’s new sandwich comes out tomorrow. 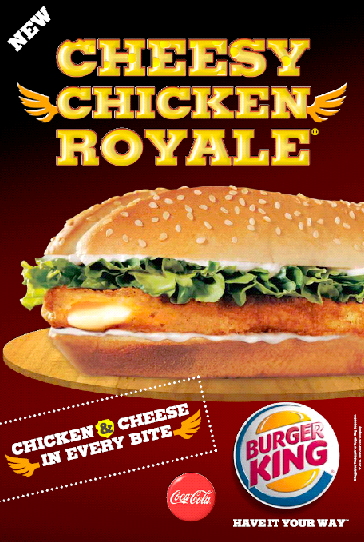 We got to taste the new Cheesy Chicken Royale sandwich today, before it officially comes out tomorrow. Burger King delivered 4 meals of the new sandwich, along with fries and coke. The new sandwich comes with cheese, lettuce, and mayo. I ordered mine without the mayo. First thing you taste is the cheese. It’s not a strong mature taste, but you can’t mistake the cheesy taste. It was wonderful. The chicken fillet was light and airy, making the whole sandwich light to eat. I think the new sandwich is a good addition to Burger King’s other chicken sandwiches, especially for people who would like to taste something other than ketchup and mayo on their burgers. Try the sandwich out, you’ll like its unique cheesy taste. Also, if you like Burger King, be a fan of their Facebook page. Special thanks to Mrs. Beebi Al-Qitami, from Kout Food Group, for this wonderful lunch. Someone is sending me some new sandwich that’s coming out tomorrow, to sample. I can’t wait for it to come. I ate my breakfast super early today, at like 7 a.m., so I’m really starving right about now. 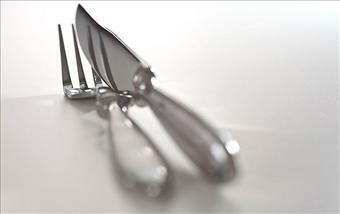 I still have to wait till 4 to eat though, and I do hope they bring the food on time. Like I said, I can’t wait. I wonder if I’m getting fries with my sandwich too.